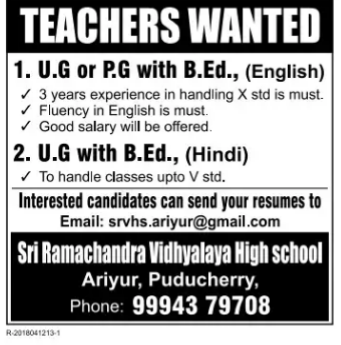 Sri Ramachandra Vidhyalaya High School, Ariyur has advertised in THE DINMALAR newspaper for recruitment of Teachers jobs vacancies. Interested and eligible job aspirants are requested to apply immediately. Check out further more details below. Name of the School: Sri Ramachandra Vidhyalaya High School, Ariyur. 3 years of experience in handling X std is must. To handle classes up to V std.